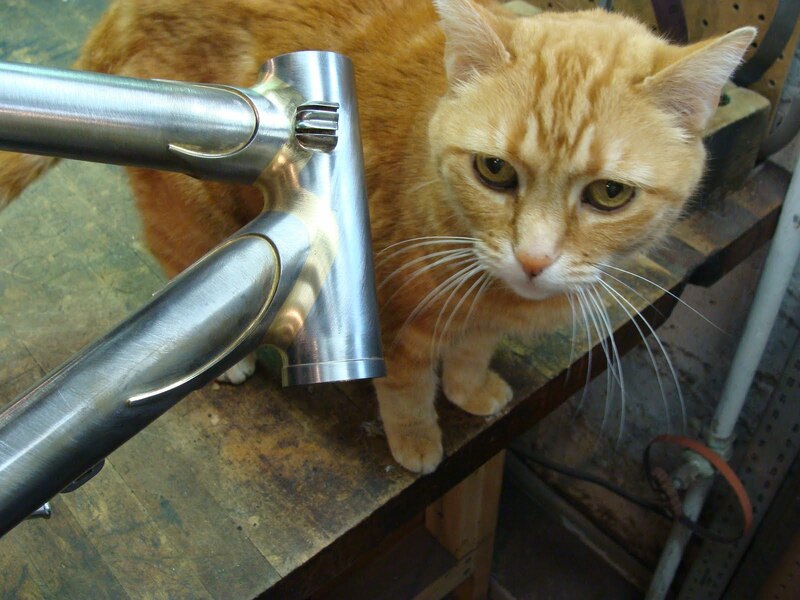 The inspector has returned, and all she has to say is, "what the heck is this crap"? 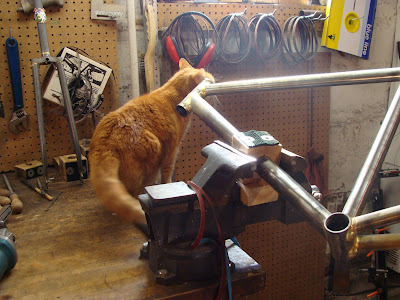 Well, I'll explain. 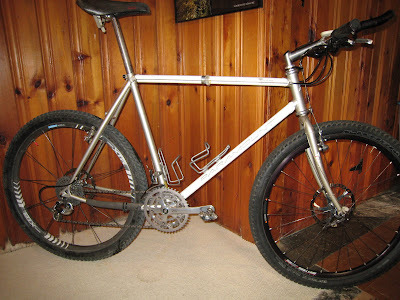 Rob sent along this picture of his lugged '92 Paramount and asked if I could build a modern lugged 29'er. Not an easy task considering the extreme angles that suspension corrected 29'ers present. 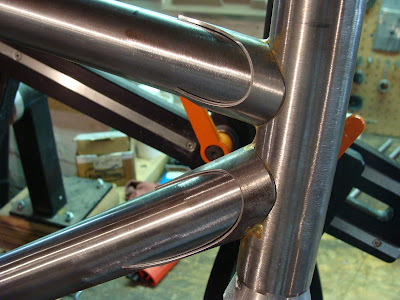 On the upside, Rob's a pretty big guy and that helps make some of the angles less problematic. 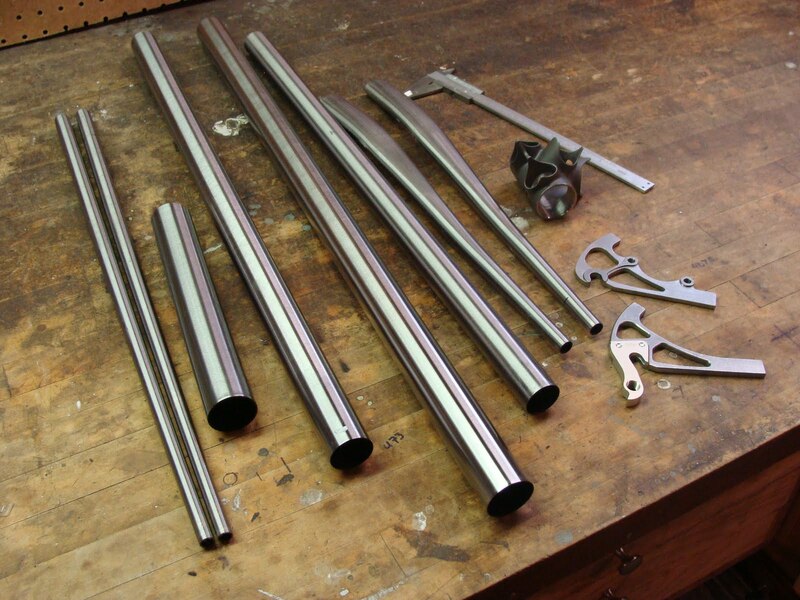 I decided to go with a standard size seat tube, 28.6mm, externally butted at the top, and then a 31.8mm top tube and 35mm down tube. A set of double bend chain stays and Paragon chain stay mount disk dropouts finishes things off. I spent a fair amount of time figuring out where to locate the bends and bumps when I built my 29'er last year, so I knew pretty well where to make my cutoffs and bumps for tire and chain ring clearance. 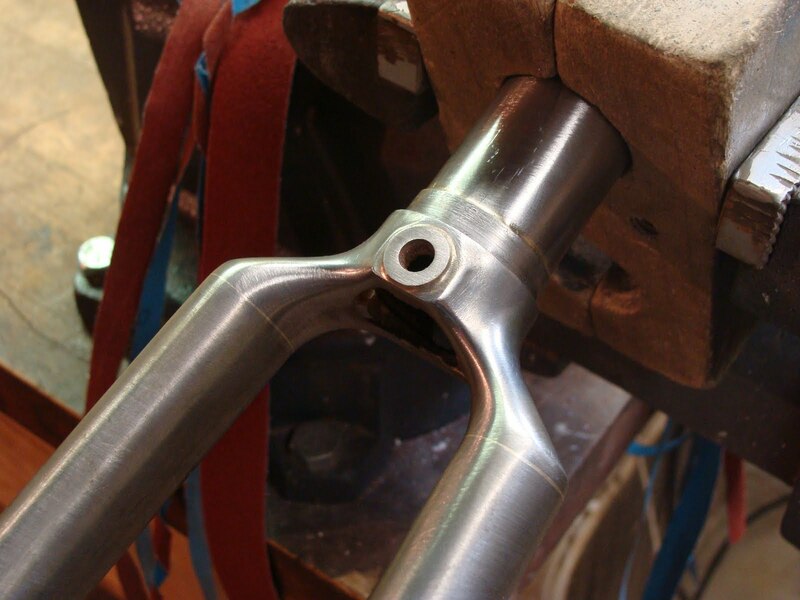 I did have to do some work on the chain stay sockets of the bottom bracket shell. 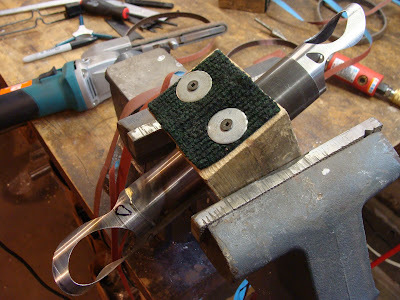 It's a road shell, so the sockets are not angled as much as you need. 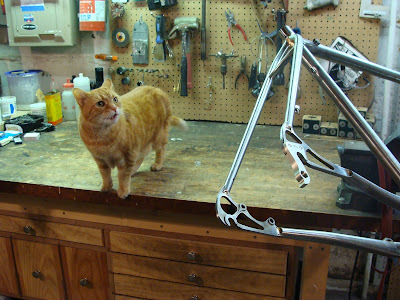 After some subtle persuasion, they came around. I used some 4130 tubing to make the Bi-Lam lugs. 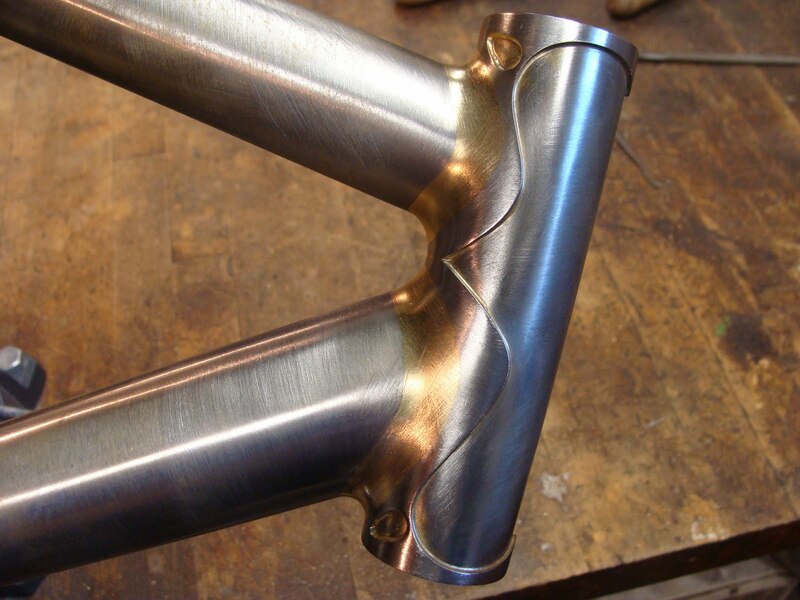 First I mitered the end to match up with my geometry, then I drew my design on the tube and cut it out roughly with a hacksaw. 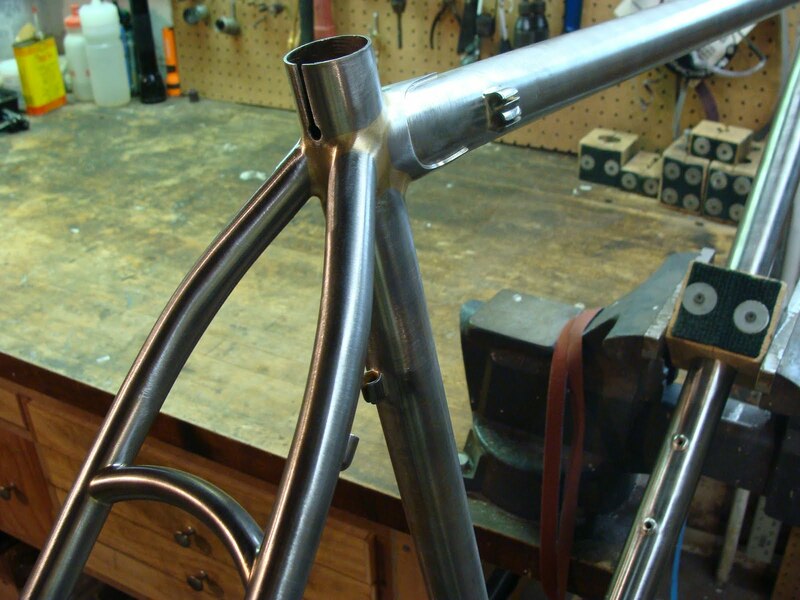 Once I had a manageable sized stub, I tacked it onto the head tube where I could do the final shaping. 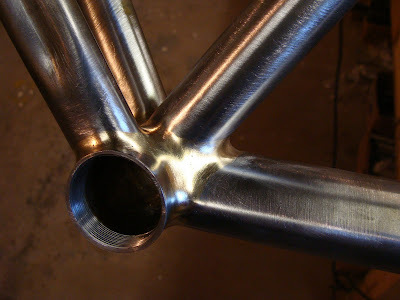 Below is the head tube with the top and down tube "lugs" attached. I made the down tube lug a little extra long on the bottom to act as a gusset and the forked tangs should distribute the stress outward. 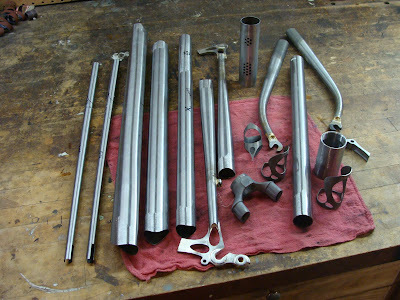 The tube set, lugs and chain stays all ready to be brazed. 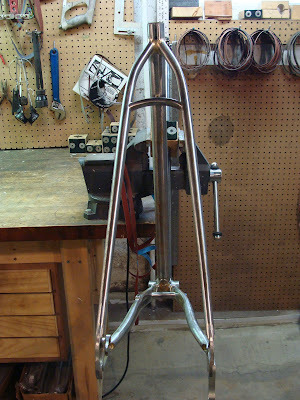 A better shot of the bi-lam head and seat lugs. Once it's finished the Inspector has to have a look! 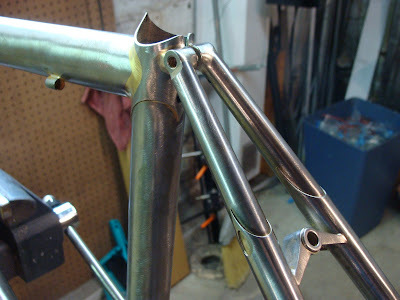 The cable guides are brazed onto the head lugs, reminiscent of Rob's Paramount. The fillet brazed seat cluster with my custom bent seat stays and bridge. Paragon dropouts. 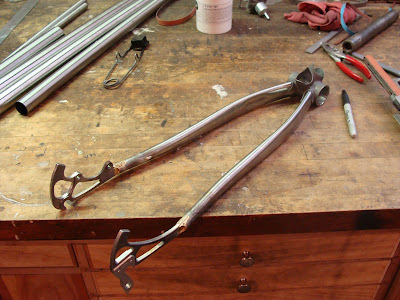 I'm really liking these! A shot of all the curvy stays and bridges. I haven't fallen into a well, but I have been neglecting the blog a bit lately! 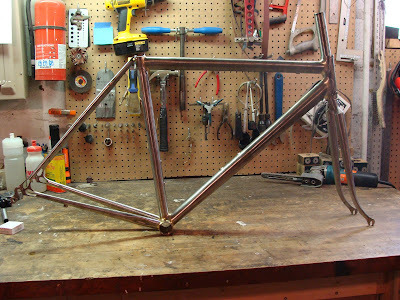 Jason, here's your ride, all ready for paint. 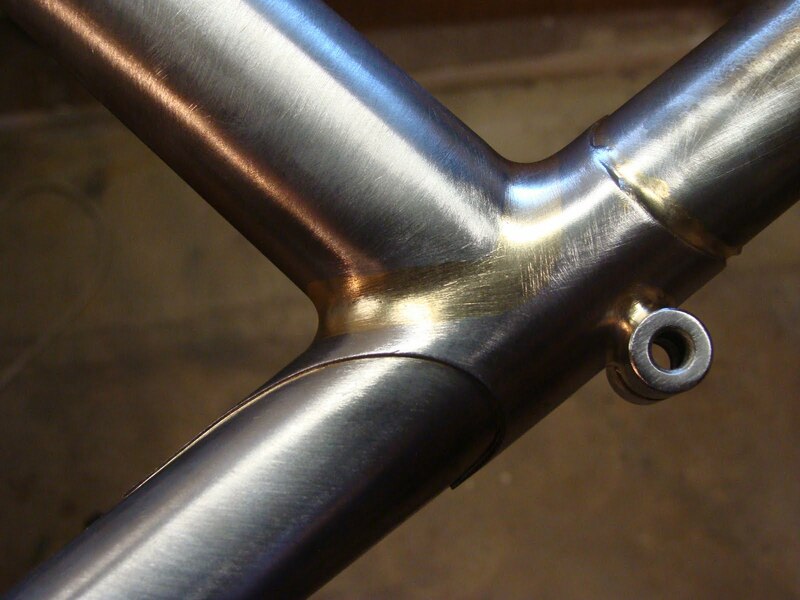 Jason's frame uses True Temper's S3 tubeset. 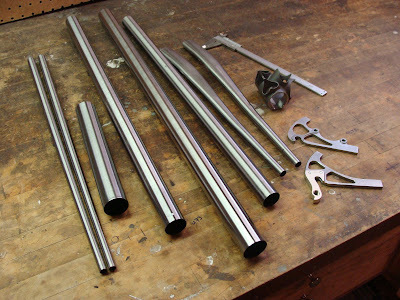 The seat tube is round, while the top tube and down tube are pretty heavily shaped. 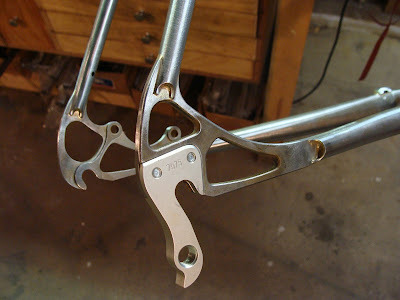 They're also quite thin, and this helps bring Jason's frame in at under 3 1/4 lbs. 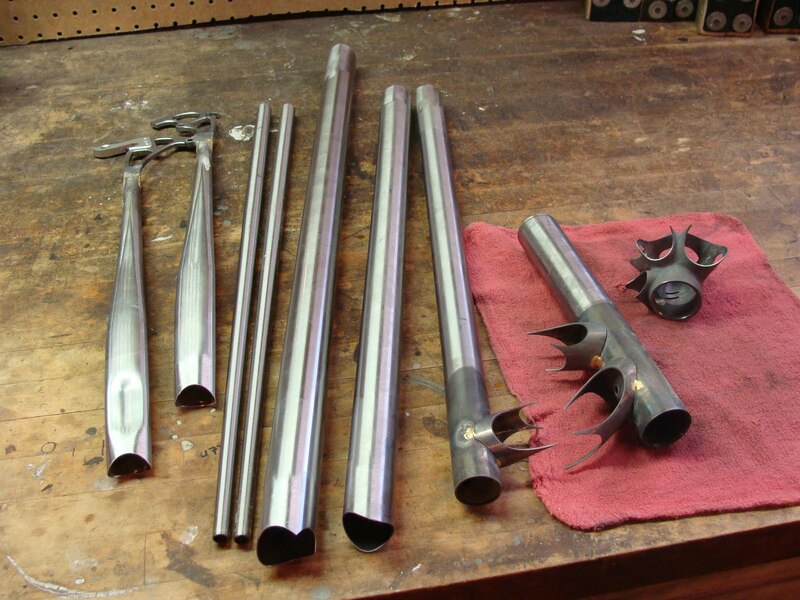 Here's a shot of the tubeset and bits all prepared for brazing. 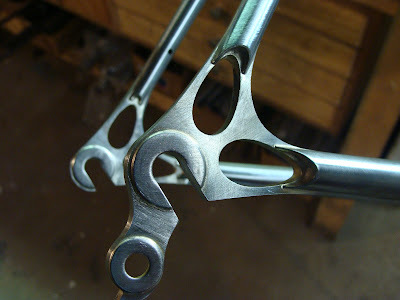 And a shot of the head lugs as I carved them out of a piece of 4130 chromoly. Frame is all fluxed up and ready to be tacked. 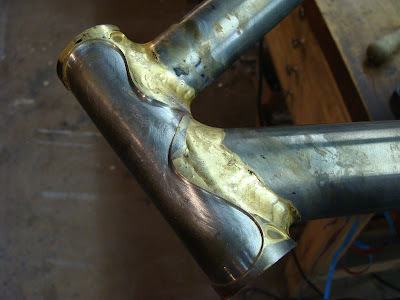 Head tube, brazed and soaked to remove the flux. 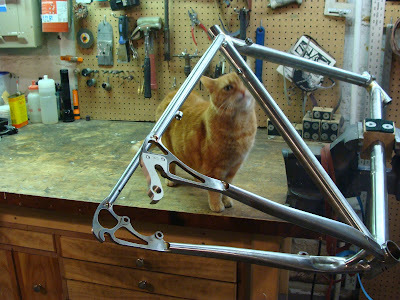 The inspector stopped down for a quick look, but she's more interested in sneaking outside now that the weather's nice. Seat cluster prior to attaching the seat stays. 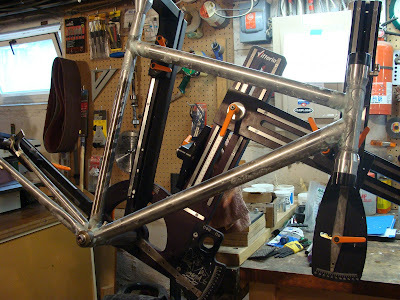 Here you can see the finished seat cluster and the sleeved seat stays with teardrop windows. 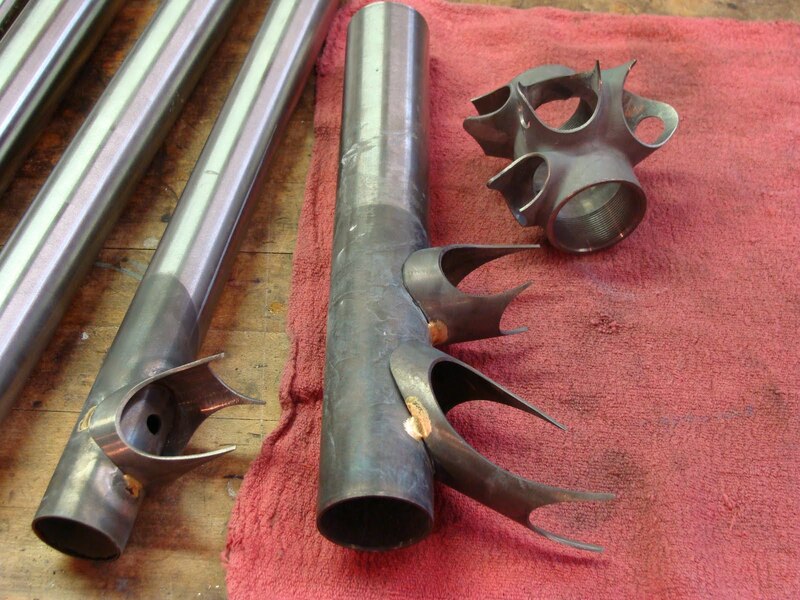 I normally use a flat crown fork for oversized head tubes, but Jason and I both agreed this one would fit better with the smooth fillets and oversize tubes.